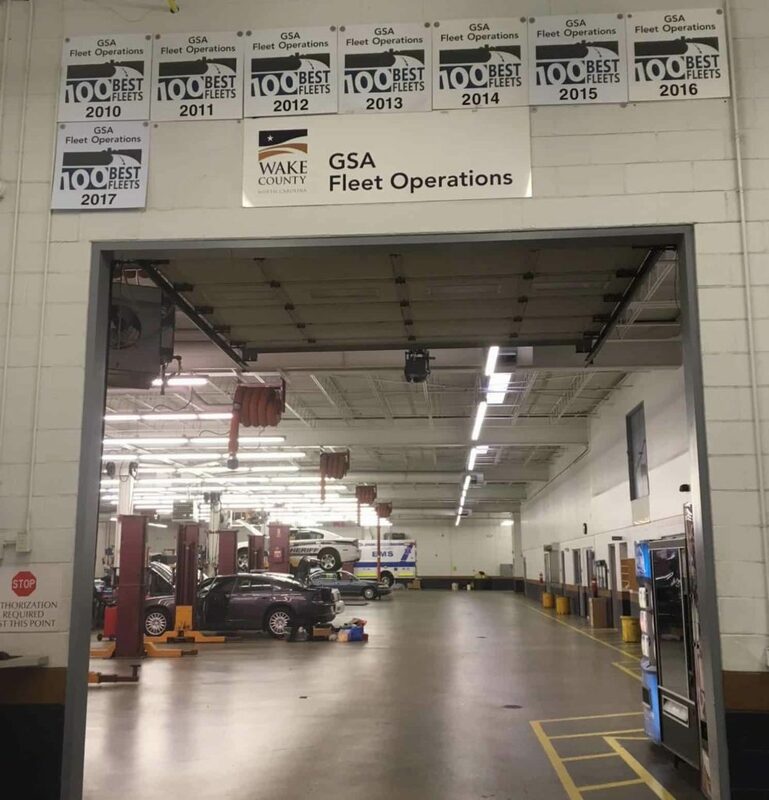 Wake County Government General Services Administration Fleet Operations displays its 100 Best Fleets awards since 2010. 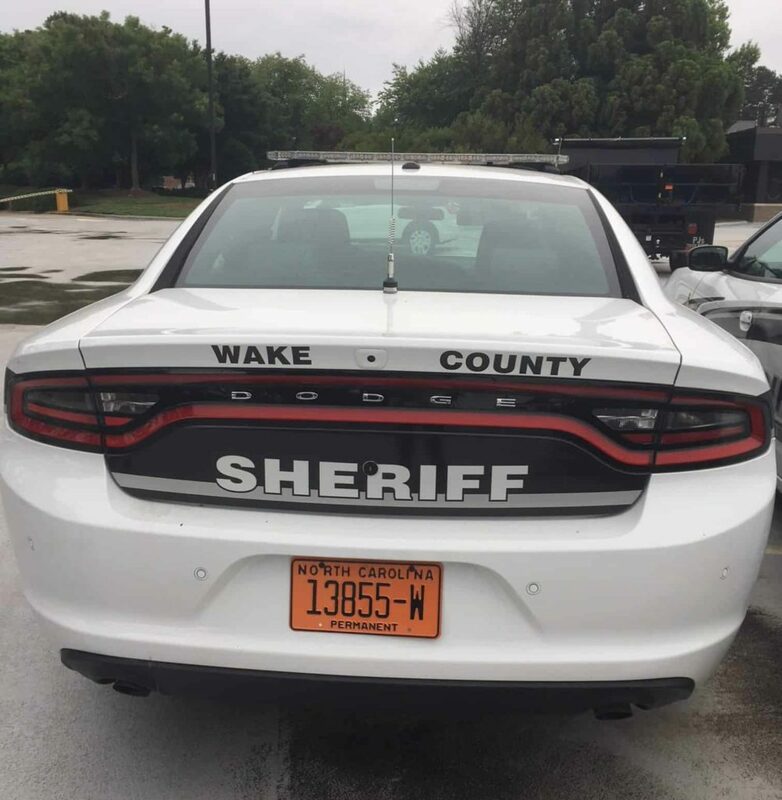 The goals of Wake County’s fleet are the same as most: to carry out productive, safe, efficient and sustainable service at the lowest cost possible. But the smartest and most successful way to achieve that goal, they have found, is by implementing new technology to continuously track data and uncover information. Wake County has been on the 100 Best Fleets list every year since 2010, once placing number three out of the country. There are about 1,000 vehicles in the fleet, including cars, trucks, trailers and boats, with emergency response vehicles representing half. About 60 vehicles run on diesel, and 20 run on B20 biodiesel, Kuryla said. 400 of their vehicles are E85 compatible. Wake County hasn’t purchased new hybrid or electric vehicles in about 3 years, but around 50 hybrid vehicles are currently in the fleet. 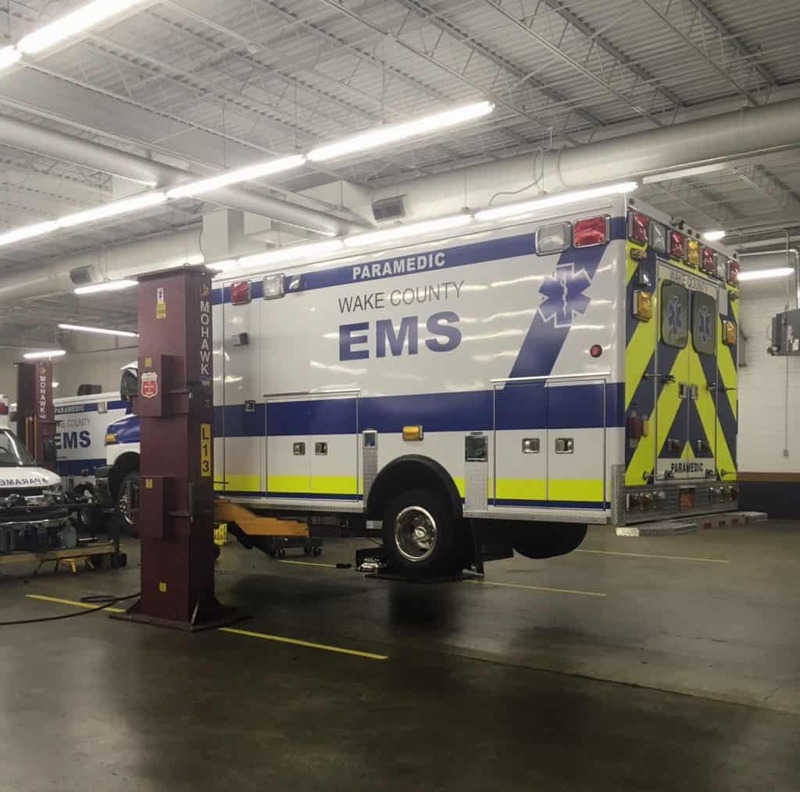 Wake County EMS truck is lifted for maintenance repairs. Out of the 1,000 vehicles and 200 that are serviced, there are a total of 10 mechanics. “Our vehicles are in good enough shape that we don’t need as many,” Kuryla said. Wake County has a preventative maintenance program in place that averts as many repairs. Vehicles are also sold with less mileage than most fleets. Many fleets keep their vehicles too long, Kuryla said, which means they’re stuck in the shop more for repairs, resulting in more downtown for drivers. Maintenance in the fleet is also done swiftly. Kuryla has been Wake County Fleet Director since 2002, and he has orchestrated and seen many changes. One of the first adjustments Kuryla recommended was to transform and redesign the service and parts departments so that they were connected, and could communicate openly as a team. Kuryla said a big success Wake County’s fleet has had is with telematics, a system that collects data from vehicles when they’re on the road to improve efficiency. Telematics tracks the vehicles’ locations, miles per hour, time spent idling, starting or stopping too fast, whether or not the driver is wearing his or her seatbelt, and more. Drivers will be alerted with a beep when going beyond their limits, and supervisors are also automatically notified in some instances. When telematics was first installed on the vehicles, drivers were getting a lot of beeps, Kuryla said. It didn’t take long for that to reduce considerably. Additional upgrades and changes are still to come. Recently, the fleet introduced reusable oil filters, which increase the life of oil and keep them from ending up in a landfill. The reusable filters were put on 20 vehicles and tested for over a year. Kuryla plans to have all of their vehicles transitioned within 6 months. The oil is also tracked with software that automatically changes intervals and notifies departments when the oil needs changing. This year, they plan to introduce a drive over tread depth tire reader, which will generate data on the pressure and alignment, measuring the tread depth of each tire to decide whether or not it should be replaced. Kuryla said the biggest challenge for their fleet is a common one — making advancements within the budget. Kuryla suggests when trying to implement changes for a fleet, it’s helpful to talk to those who will be affected by asking their suggestions and opinions. For example, the new tire depth reader is talked about openly in the shop on purpose, Kuryla said. He hopes to increase interest and encourage discussion. When the oil filters were implemented, the mechanics openly discussed their experience and then helped come up with a better system.